What do most people love? Here are a few things I think answer this question. 1. To support something they believe in. 3. To have their faces seen and their voices heard. These are three simple but oh-so true qualities we’re committed to remembering when we unleash “Paint The Town Read” on February 14. The thing to support: reading for fun. The bigger something: the whole area will have the opportunity to celebrate together and watch signs pop up in yards and windows across the region. There are several other bells and whistles we’re planning. 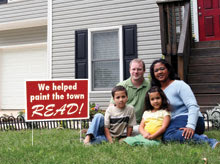 To get the simple gist of this initiative, we’ve put up a very simple Paint the Town Read web page. It’s still evolving, so stay tuned. I’ll keep you posted as we move forward! The painting begins on February 14 and goes until our giant Red-Read Party at ImaginOn on April 18 (yes, that’s National Library Week!). Here’s to celebrating our community, reading, and public libraries! Woo hoo! This is gonna be great!